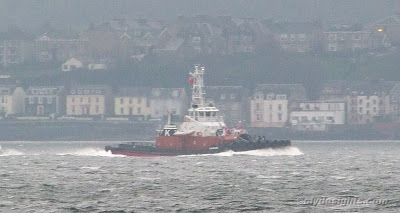 A recent visitor to the Garvel Drydock left Greenock this morning and headed back to the Solway Firth, where she has been working in connection with the construction of an offshore windfarm. Owned by J P Knight (Caledonian) Ltd, the tug KEVERNE is a sister of KINDEACE, which spent several months working on the river last year. She was built in Japan in 2006, and completed as AZUMA MARU. Purchased with her two sisters by the Invergordon-based company, she made her way to the UK under her own power in 2007. KEVERNE is 32.5 metres in length, and has a gross tonnage of 393 tons. Twin Niigita azimuthing units give her a bollard pull of around 65 tons.